The GoPro doesn’t resemble a conventional camcorder, as you can see; neither does it behave like one. It looks more like a small square box with a protruding lens than a sleekly designed camcorder. Although you can hold it like a traditional camera, it’s more comfortable to hold when it’s attached to something. GoPro Hero4 in waterproof housing. 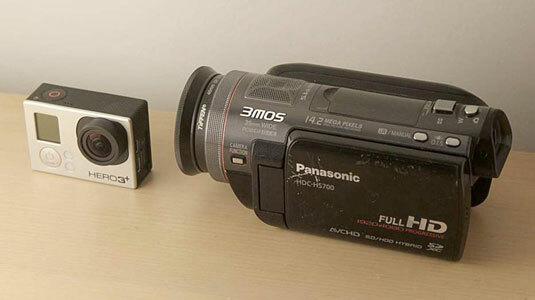 GoPro and Panasonic HD camcorder side by side. Most models don’t have a viewfinder: Though the viewfinder is one of the main parts of a camcorder, only one current GoPro includes a viewing screen. That’s okay because you wouldn’t look through a viewfinder for most situations. The lack of a viewfinder doesn’t mean you have to imagine where the action will take place. Simply use the GoPro App, which transforms your smartphone or tablet into a monitor. 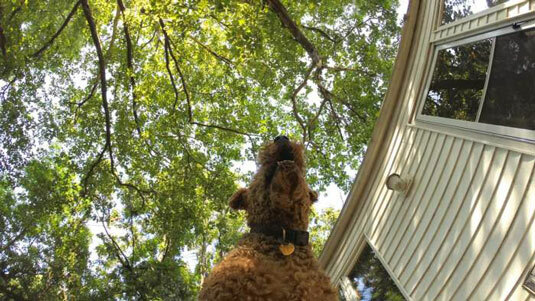 Wide-angle view: You won’t find a zoom lens. 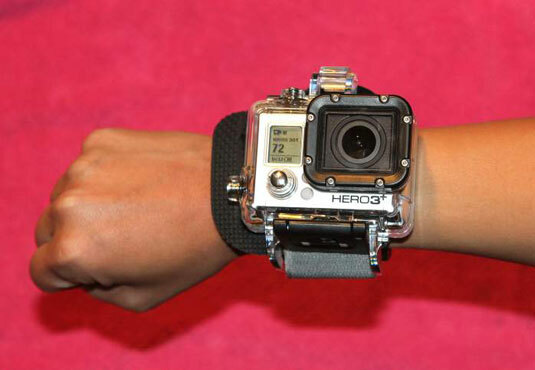 Instead, the GoPro uses a fixed 170-degree lens that provides an ultra-wide view unavailable on any camcorder. Just a few years ago, merely having a moderate wide-angle view on a camcorder was a minor coup. Going reasonably wider often meant using one of those poor quality wide-angle adapters that screwed on the filter or clamped over the lens. Adapters produced exaggerated distortion, especially on the edges, creating a foggy appearance. The GoPro provides a wider perspective than those old accessory lenses, as shown here, and does it with impressive optical quality. Waterproof housing: Take your camcorder out in the rain, and pray that doesn’t die. Attach it to a surfboard, and read it its last rites. Not so with the GoPro. 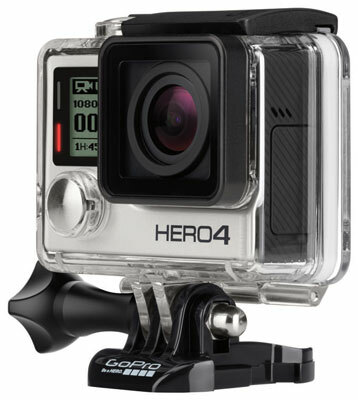 Thanks to its clear polycarbonate housing (with glass lens), you can use a GoPro in, around, and under water. The waterproof case is rated shockproof and waterproof up to 131 feet. The Dive Housing can go even deeper. Headband: The headband attaches to your head so you can get that walk-through look in your video. Wristband: The wristband looks like a wristwatch, as you can see here. Capture timely footage simply by twisting your arm. Bicycle helmet: Wear the camera on your head to get the unique perspective of a cyclist. Body harness: The harness allows you to transform yourself into a living dolly. Instead of moving the camera through the scene and capturing choppy footage, be one with the camera and move through the scene in Zenlike splendor.